Catherine Phil MacCarthy was born in Co. Limerick and studied at University College Cork, Trinity College Dublin, and Central School of Speech and Drama, London. She taught at Waterford Institute of Technology (WIT) and at The Drama Centre, University College Dublin, before turning full-time to writing in 1999. 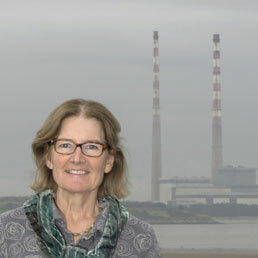 She received the eighteenth Lawrence O’Shaughnessy Award for Poetry of the University of St Thomas Center for Irish Studies in April 2014 (for more details, click here). (Link to O’Shaughnessy Award Page). She recently completed an artist’s residency at Centre Culturel Irlandais in Paris during Spring 2013 (further details can be found here). A selection of her poems is included in Poetry International by Munster Literature Centre, and more recently in Jeune Poésie d’Irlande: Poètes du Munster 1960-2015, an anthology of contemporary Irish poetry. (For more details, click here). She is a former editor of Poetry Ireland Review (Numbers 57, 58, & 59). Writer in Residence for the City of Dublin (1994), and at the Department of Anglo-Irish Literature, University College, Dublin (2002), she has also worked as guest writer at Dun Laoghaire Institute of Art, Design & Technology, and at St. Patrick’s College and is a freelance tutor in Poetry and Creative Writing. She is available for readings and has read for many Poetry Festivals in Ireland and abroad as well as Irish Studies Centres — Glucksman Ireland House, NYU; Villanova University; Boston College; University of Massachusetts at Boston; and Concordia University Montreal.